One of the biggest landscaping trends for 2019 that I have been noticing is accent patio designs with bold natural elements like large boulders and rocks. 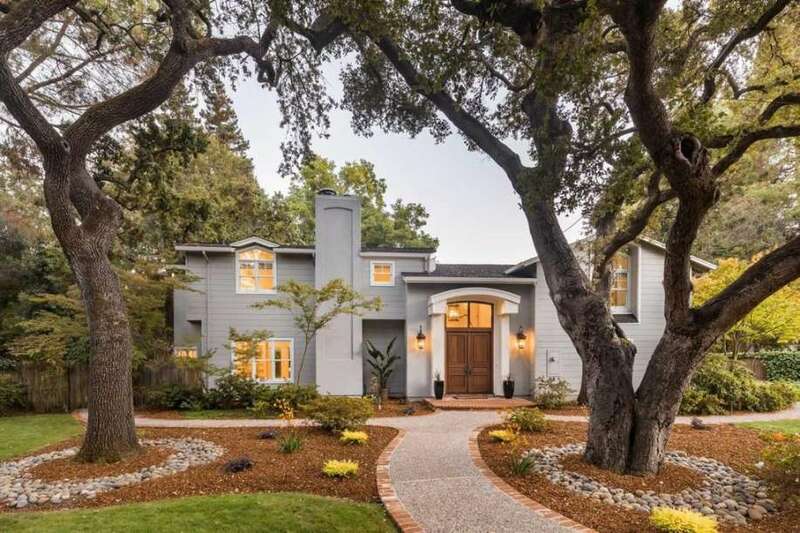 This look is especially popular in the Southwestern arid regions where it is a bit more challenging to foster lush green landscaping and large mature trees. Landscaping with rocks provides a great contemporary alternative to your typical backyard garden materials like flower beds, bushes and trees. Even better, utilizing large landscaping rocks makes the property much easier to maintain as they don't require mowing, pruning, watering or fertilizer. 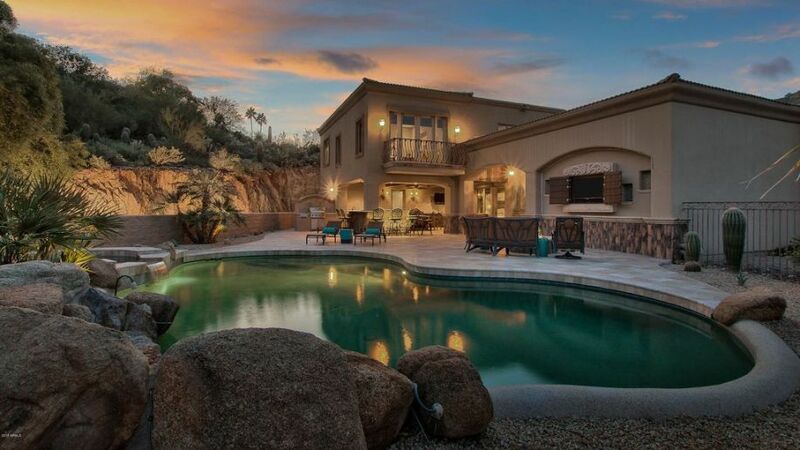 Plus they are an absolutely fantastic accent to the desert landscape and stucco siding that is so popular in this area. 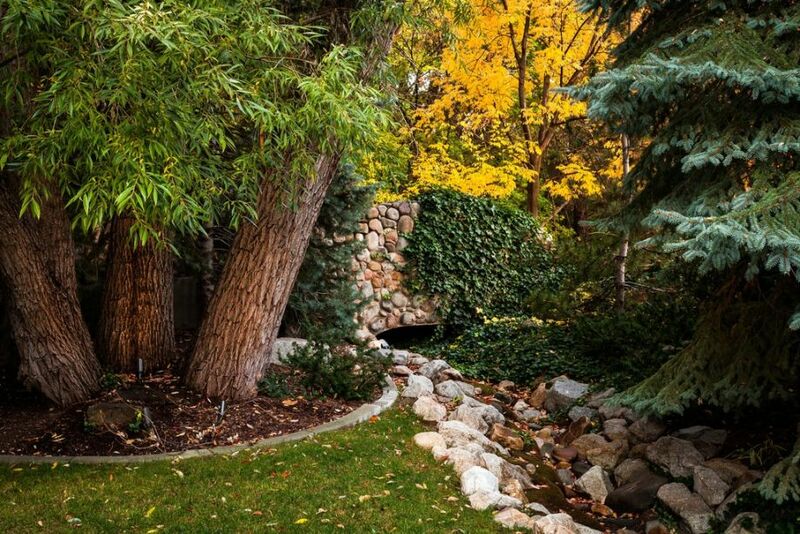 Whether you need to create a natural retaining wall or you just want to add a unique decorative twist to your property, I always suggest taking a look a landscape boulders to create the foundation of your design. These features are available in a ton of different shapes, sizes, and colors that blend well with nearly any shades of shrubberies, deck or patio materials, and exterior architectural style. Most of our clients use them as landscape edging along a man made pond (like we did in this backyard) or as a border against a retaining wall. I enjoy landscaping with rocks because they give a very organic look to the space and make man-made elements seem like they were always a part of the yard. You may think that adding rocks and stone into your design will greatly increase your spending. However, there are numerous simple ideas that include landscape borders with rocks that can be done at an extremely affordable price. One way to cut down spending is to skip hiring a professional designer and do the project yourself. You can plan your exterior garden design by using a free landscape design software program and create a layout like the professionals. Another way to cut down spending is to search out sales and discount stores where you can find cheap and affordable rock prices. You can easily find some of the best patio stones and materials to begin landscaping with rocks at very inexpensive prices when you shop online and during sales. 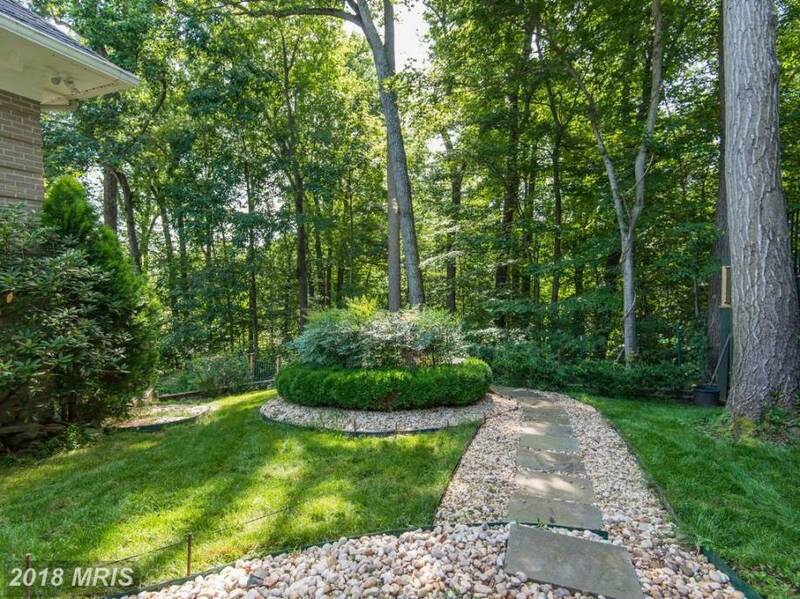 Landscaping with rocks is one of my favorite techniques to prevent that overly "man-made" look that a lot of yards can take on if you do not hire the correct designers. Of course, if you like that look disregard my comments, but I personally think that utilizing cool elements such as river rock landscaping like we used in this yard can really escalate a design. Rather than install your typical mulch drainage system, we instead lined the channel with these gorgeous natural stones. To tie in the retaining wall behind, we also covered that in the same material. The result makes it look like a charming natural creek running through the backyard. You can easily find products like these in the rock garden section of your local home improvement store, just keep an eye on the size and color pattern of these products you choose so that they look the most natural in your yard. Planting a variety of landscape trees and bushes throughout your space can make for a beautiful look in your yard. If you are looking to make your space more private, with a more natural look and no wooden fencing, build yourself a natural privacy fence. The best types of trees or bushes for this type of fence are the Green Giant Arborvitae surrounded by decorative rocks. This tree belongs to the evergreen family and can grow up to fifty feet tall and twenty feet wide. Line the perimeter of your backyard with these beautiful trees for a natural year round privacy fence. Maple trees and loblolly pines are also some great trees to add to a yard that will add a gorgeous look to your space. We have been looking around our neighborhood lately admiring everybody's beautifully landscaped yards and backyard pools. We have been wanting to add some cool new pool landscaping ideas to our property to "keep up with the jones" but really didn't know where to begin until I found this awesome property online. 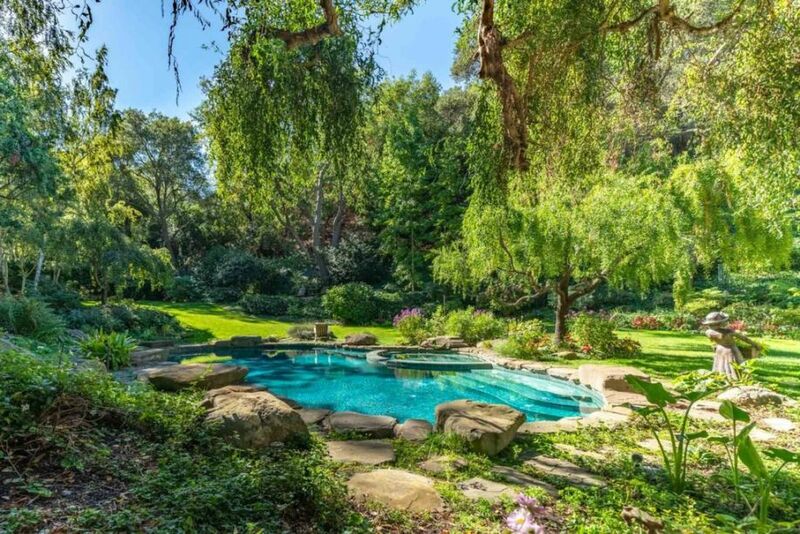 We loved how they used landscaping stones to create a grotto look to an ordinary kidney shaped pool. It would save us money because we won't have to completely redo the pool, but will give the entire design a whole new look. I am currently looking for a contractor with experience landscaping with rocks like these so we can get started!